Exclusive Distributor of Innovative Decorative Concrete products. Training cutting edge process for cost efficient diamond processed concrete. Providing decorative concrete Services new and remodel. Stain Pro professionals provide advanced, superior diamond polished stained concrete flooring with the fast majority of products processed INTO the concrete. We also provide outside staining and garage flooring in Texas, Oklahoma, and Louisiana. We are a group of professionally trained and skilled independent contractors. We pride ourselves in providing the best in decorative diamond processed and polished concrete for commercial and residential applications for large and small, new and remodel projects. We are dedicated, forward thinking and attuned to advancing our industry. Our innovative cost efficient approach through diamond processing and polishing concrete floors offers many advantages for customers such as greater durability by processing the majority of products INTO the concrete floor instead of leaving them on top of the concrete. The Stain-Pro process increases floor life and lessens required maintenance. While much of the decorative concrete industry is still using outdated inferior stains and topical sealer's the Stain-Pro process advances the industry by utilizing Stain-Pro Crusader diamonds, thru grinding and polishing the concrete. We infuse Stain-Pro products into the porous concrete integrating them with the concrete. 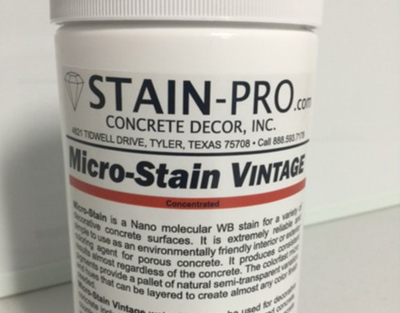 This process utilizes Micro-Stain Vintage a superior micro pigment stain colorant for concrete. 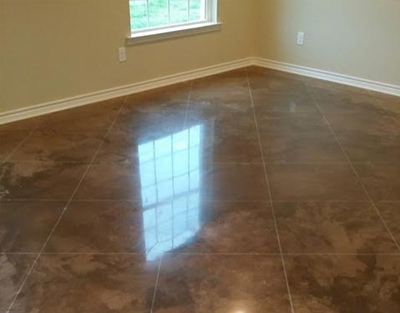 Followed by our best in class penetrating concrete densifier Nano-Tech which strengthens concrete for polishing in combination with Stain-Guard resulting in SUPERIOR interior decorative concrete floors. Each one-of-a-kind original custom floor is processed on site utilizing the character of the existing concrete slab. Customers select their preferred Stain-Pro Vintage stain color and the independent applicator displays a sample of their color choice on the concrete. The floor sample is displayed for the customer and can go from a lighter semi transparent color with an abundance of variation all the way to a darker motif with a lessening in variation. You control the amount of color the applicator uses. It's your custom floor. Most customers prefer a one color variation, however the applicator can also layer the colors to achieve an individual custom look. Each floor is unique and no two floors are just alike. 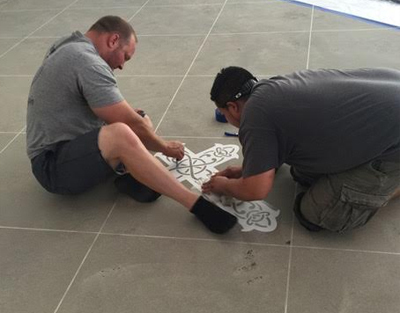 Custom floor graphics are also another way in which to achieve a one-of-a-kind look for idividual taste. The Stain-Pro process combined with Stain-Pro products delivers a superior value for interior flooring, and the results are beautiful, durable and cost efficient. © 2019 Stain-Pro Concrete Decor, Inc.